"The Final Days of Superman" - Part 5: "Omen of Death"
Superman and Wonder Woman, with Batman trailing behind, are chasing the trail left behind by the false Superman, tracking him to China. To the surprise of Superman, Batman expresses happiness that Clark and Diana have made peace and are friends again. The trinity all climb into the Batplane as it nears Chinese airspace but despite their stealth safeguards they are detected and knocked out of the sky. The Great Ten (albeit only seven) are there to greet them and instruct them to leave immediately. Cue a fight and with seven on three it's particularly frenetic but during the fracas Yeti suddenly loses control and starts fighting with his own team. Despite the danger Superman races to help and finds a magical medallion that had fallen to the ground. Before Yeti can land a killing blow on The Ten's leader Superman places the medallion on him, quelling the beast's rage. Superman's deed brings the battle to a halt and a truce between The Ten and the Trinity finally leads to a discussion. Superman explains that an impersonator has been killing people in his name and fled into hiding somewhere in China. Batman tells them all he has narrowed down the energy signature search to the Loess Plateau, Shanxi Province and with the help of The Ten they arrive at the laboratory of Dr. Omen. Dr. Omen tries unsuccessfully to hide the source of energy. The heroes remain patient while Omen explains she was doing what she could to help China. She states that Wu Meixing was capable of creating a super being every three days but each of those champions she created had a lifespan of approximately seven days. By using Superman's unique Solar Flare energy she was able to create a living being without the genetic lifespan of a week. Superman looks into the glass chamber housing a Chinese man in a variation of his armor but points out this doesn't appear to be the same as the glowing Superman that escaped from A.R.G.U.S. Catching them all unaware Dr. Omen releases the Super-Man. While The Ten take Dr. Omen into custody for her illegal experiments, the Trinity are itching to give chase. The Ten advise them to leave China before they become embroiled in an international incident. They can follow the Super-Man once it is outside Chinese borders and as Superman, Batman and Wonder Woman leave, The Ten wish them luck in their quest. Meanwhile at that very moment in Metropolis, Lois is startled by a tapping at her apartment window. The energy Superman has tracked her down and invites her to the balcony so they can chat. Considering the attack on the Daily Planet, Lois is understandably nervous but she steps out onto the balcony to meet him. Story - 3: After the depressing ending to Part 4, it was nice to see Superman and Wonder Woman happy and even Batman smiling was in stark contrast to their predicament. The Super Friends gag made me smile. The fight with The Ten was not a welcome one, I found it unnecessary in every way even with Superman's intervention and some fantastic art. It did zero for the story especially considering, literally minutes prior, they had battled Ulysses. There was plenty of ways to show the USA v China relations other than a throw down but I know that also would have made for a pretty boring comic action-wise. Mirroring "Return of the Superman", we now have interesting new versions of Eradicator, Superman in Black and now a Chinese Super-Man clone. I am a bit disappointed that Dr. Omen was dealt with so quickly, she didn't even mention she was the mystery figure Superman saw when he first Solar Flared. I am not an avid follower of The Ten, Dr. Omen or Wu Meixing, though a quick google search is a solution, it would have been nice if Tomasi had given a little more detail as to who they were and what they were talking about in a little more detail. Similarly the plot ending with imposter Superman seems to flit in and out, I am really keen to find out what is really going on, that's a compliment to the writing but it is also a frustration that five chapters in we know very little about him. Art - 4: Doug Manhke continues to impress. Now that Clark is not in the T-shirt get up and is looking a bit more like his old self, we're reminded of what we missed. One more reason to feel a little down. Saying goodbye to a Superman that has spent his entire run since 2011 being unhappy and continually kicked in the gut... to see him smile meeting Bat Cow... it may sound silly but the combination of this art and this story is just fantastic. The new Batman suit isn't fantastic, but then it's designed more to be stealthy. Bruce without the cowl spoke more to me than the caped crusader. With only one issue to go before cancellation I think I will truly miss the Tomasi/Mahnke team. Cover Art - 4: I thought the artwork was exemplary. The fight scenes, where unfortunately confined to several small panel sequences, evidence of padding out which was disappointing as the art wasn't given a real opportunity to breath. I wish I knew who was fighting but that is an editorial quibble rather than an art based one. If I were to complain about one aspect its that Batman and Superman weren't featured more extensively in the issue. Variant Cover Art - 2: A disappointing cover. 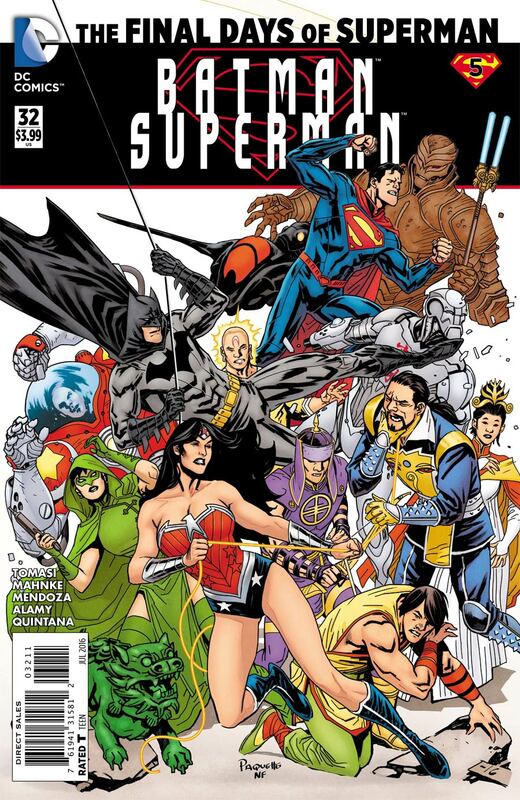 Considering it is the first appearance of The Super-Man something featuring him would have been more fitting than squeezing in thirteen combatants and the batplane on the cover in a compressed and confusing altercation. It just seems so busy and perhaps too 'flat' because the coloring has no depth to it.